Slow progress due to 23 deg this morning and a high of 36, winter solstice, and 1+ hr lunch break. Looking good mike on the progress, I think i used a peice of 1/4" plate on my wheel adaptor bracket, though as cameras are hard too get exact details that might be heavy enough.the barrel of wood i chunked two days ago looks too be drying good and fast, so that will be a big time saver getting dry wood. Michael, that axle assembly setup looks plenty sturdy enough. I didn’t know the F-350 was that heavy-duty. We have had and still have E-350 vans at work, I will have to take a look! 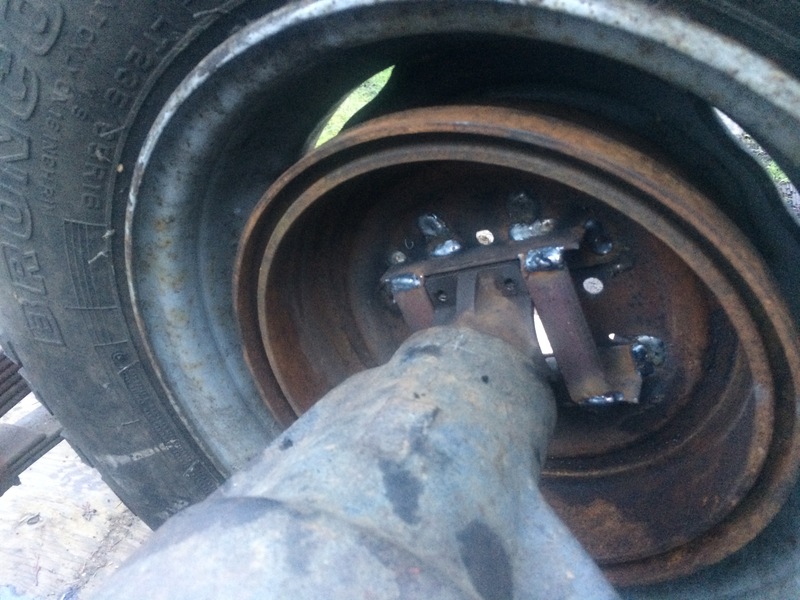 Are you going to drive that wheel with a belt or friction roller, or something else? anyway, looking good! My son is a Ford mechanic and so he scored a used belt and tensioner from a diesel. Now I need to buy or modify a 3” pulley to fit a engine. I would think either the 2 HP electric or 6.5 HP would be enough. Your final drive ratio is pretty low, and that big truck tire is a heavy flywheel. The belt will act as your safety clutch. I would start with the electric motor myself. A 2 HP motor on 220v is fairly potent with lots of torque and quieter than gas. Later, wood-gas fuel the 6.5 HP and try that. If i remember right I think Chris broke the shaft off a 2hp electric. I think its due to the stock loading. Now a 5hp electric on his and I followed suit on mine. I haven’t had any problems with mine. I also bought a hf 6.5 hp but it concern me as it has a 3/4 shaft like the 2 hp electric. Maybe add another flywheel between the motor and the flywheel on my baler gearbox. What do you fellows think? That might be happening on the bailer gear boxes due too direct hookup too the flywheel, on the rear axel type there is an extra reduction pully too add a sliping point. Hopefully Anyway. I think Chris did not use a spring loaded tensioner on his belt drive which could result in more shock loads. Regardless how well the chunker was thought out and planed after using it for a while you will discover things that should have been done different. A heavy flywheel is important to neutralizer the shock of the cutting. Before I added a heavy flywheel ( about 80 pounds turning 300-400 rpm ) I broke the PTO shaft on my little tractor. It seems the first 5 years of use with my chunker I was always modifying and changing things . I learned to be in a good comfortable position while chunking ( sitting down ) . When comfortable chunking it is a enjoyable job. I did a lot of shopping trying to find a large truck rear end but just too expensive. I have studied your videos and seen some of your evolutions. Really like the auto feed you have. Hi Michael , i think i could cut probley. Two inch branch if i had your wheel blade slittly tapered, Or about the size of an 1-1/2"pvc pipe,when i finish a cut i can hear the ring and pinion clashing, so i need too. Reeset the ring and pinion after the oil flush thats in it rinces the bearing good. It serprized me i got two full barrels of wood just trimming my newbers pine tree away from his roof and the low ground branchs. I agree! That dry wood chunks hard! Had to sharpen my roll over edge. Waiting for the new cherry pruning that will come off in February all the old wood will be thrown into the retort. Looking good on what you are doing. Agree, The fly wheel will take the shock out of the motor when cutting. Been working 6+ hours every day on this white elephant! Why is it that Wayne can knock out an entire gasified truck in a week and I am still not done with the chunker in 2 weeks. So I have it mounted on a 3 point stance, the 2 hp 1780 rpm motor mounted, a Ford serpentine belt, spring tensioner and 2 1/2” pulley installed. As it was getting dark today , plugged it in and measured 34 rpm on the cutting wheel. Now just mount the cutter anvil and rustle up some 2” to 4” green wood stock to test with. I have a 230 v 10 amp emergency stop switch and waterproof box coming from China, and will make some safety shields for the moving parts. After you have build your 12th wood chunker you will be able to build one in a week or less. You are building it a lot faster then I built mine. Good job. I like it Mike! I can’t wait for the video of it gobbling up some wood. 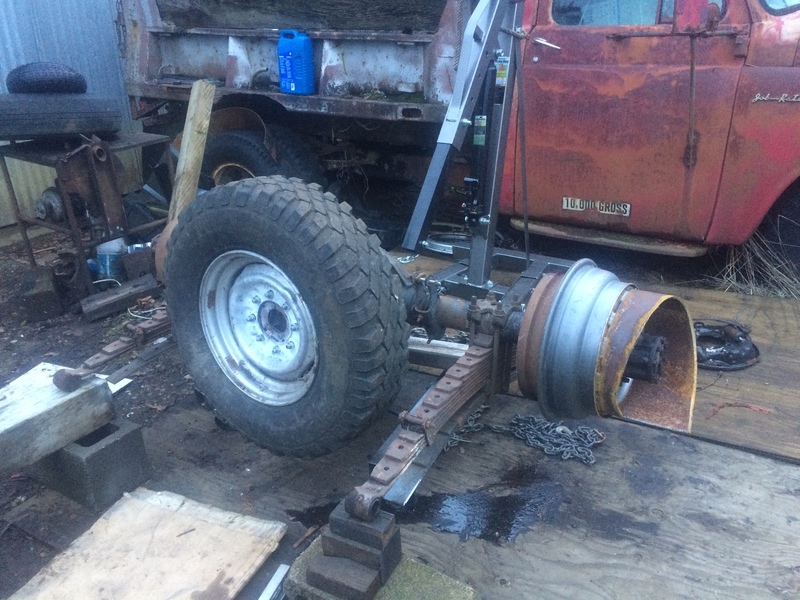 Looks good mike a few more bars and plates around the cutting wheel supports you will have a nice quite running chunking tool.whare my wheel bottoms out i have a 1/2" plate ground too a point on one side too help cut as it chunks. Hard too explain but you will have too see witch side too grind a point on , and i left some jagged edges on the stationary cutting plate, may be yours i can learn something new.Thanks posting the build, it looks well made. What Bill said. I guess this one was just a teaser. Is the 4 - 1 1/4” pipe frame stout enough to resist the flexing and bending forces? Is the little 2 HP motor stout enough for up to 4” green wood? Will know soon and modifications will follow! I like those 26 second videos! Nice engine work!